I’m from Italy, but during my five years working at the Club Méditerranée bar I learnt and fell in love with the french language. I knew I wanted to move to Paris, as it has one of the best cocktail scenes in the world and become a bartender there. 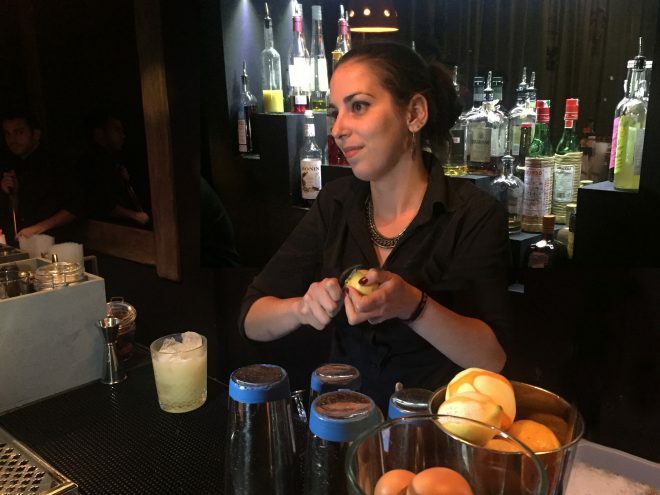 So, I moved and joined La Mezcaleria two years ago, where we create quality drinks rather than high quantity. Mezcal and pisco were not originally on the top of my spirit list, but working here, that has now changed. I like to to learn new stuff and the bar is a great place for that. It’s a tough job so you really need to love it to constantly change and progress. My dream bar would be a place where you can find a mix of italian spirits and french spirits, with an old school style. For instance, I’d like to use the types of alcohol my grandparents used to distill like homemade grappa and I’d use old calvados and armagnacs too. The bar would be at the French and Italian border or maybe even one bar on each side of the border. It would be a small speakeasy hidden behind a record shop with around 20 seats to chill and enjoy a small list of less than ten cocktails that would change seasonally. The music and furniture would be from the 60’s-70’s with a delicatessen and cheese for food. On my days off, I tend to go to drink cocktails in other bars like Tiger because I’m really into gin at the moment. I also hang out at Bespoke and Pas de loup because they are close to here and really nice people. I also love to visit Calbar. I really like pisco, as it reminds me of white grappa from Italy. The Mosto Verde pisco literally takes you on a journey the minute you open the bottle and smell it. Pisco also strenghens the other flavours of a cocktail. You need a premium spirit and a crazy bartender. The bartenders touch makes all the difference to a drink. I would say ginger as it’s unique, spicy and surprising. But it’s also strong, so you need to work on the balance of it in a drink. You must go to Italy and visit Small Batch at Abano Terme, Jerry Thomas in Rome and Dead Rabbit in NYC. Come and meet Elena at France’s first Mezcal and Tequila Festival, Autour de l’Agave on the 25th, 26th and 27th February.